After two disappointing books, I've fallen back on one of my favorite authors, Kate Kingsbury. Before I delve deeper into this review, I do have to mention the two books I've dropped. The first one was The Outstretched Shadow by James Malloy and Mercedes Lackey. I made through 80+ pages before I finally put the book down and said "Enough, I can't take it any more." The back cover looked promising, a young mage (Kellen) finds three magical books which hide themselves from other people except they seemed to have sought him out. The authors then decide to go through every inch of the city this takes place in. When the book is not describing Kellen's boredom and restlessness, or the intricacies of the city and the mage council, it shows what a sexist, arrogant man Kellen's father is. When Kellen found the books, I thought, "Great, the action's going to start." Nope, not even close. I think thirty or forty pages after that when nothing still happened or showed signs of happening, I went to Amazon to read some reviews and found several reviews which followed my train of thought. That's when I decided to abandon the story and move on to something more interesting. Luckily, I found it, but not before another disappointment landed in my hands. I started Strangled Prose by Joan Hess, and about half way through, I've set it down and haven't had the inclination to pick it up again. I might later. The murder didn't happen until about a quarter way through the book and the police detective is a trifle unbelievable, even for fiction. I'm also finding it a little difficult to like the sleuth. It started off funny, but then it became too funny and lost its charm. I might pick it up again, but who knows? The trouble I had with this book is it was light on the mystery and focused heavily on the characters and their love lives or lack thereof. Polly pines over Sam while Lady Elizabeth pines over Earl, it seems Beatrice Carr from the last book fancies Martin who gives her things because he feels sorry for her. Oh, yeah, there's a murderer running around Sitting Marsh killing American GIs who have red hair with daphne berries which are toxic. Earl wants it stopped and asks Lady Elizabeth for help. She's only too happy to oblige and eventually solves the case with help from GI Joe Hanson (I think) and Sadie in a trap Earl and Lady Elizabeth set up. There are also some RAF men causing problems, beating up the American GIs and vandalizing property. At first, Lady Elizabeth thinks they have something to do with the poisoning, but later finds out it's not true. However, she still wants the shenanigans to stop. This seemed more like a story of the going-ons in Sitting Marsh and less like a mystery. However, because I feel I know these characters so well, it didn't bother all that much and it's also a quick read. That pretty much sums up the whole book. 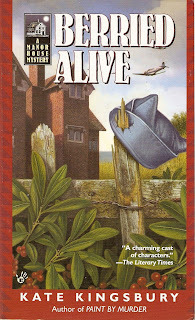 Aside from solving the case, this book doesn't end well for Lady Elizabeth and Polly. That didn't disappoint me as sometimes life turns out that way and the Polly/Sam story line was already bugging me. It seems that Kingsbury is becoming bored of the series or writing them too fast. Somehow I get the impression Kingsbury prefers the Pennyfoot Hotel series over the Manor House. I've read the first in the Pennyfoot Hotel series, but can't continue until I get the second book which is taking a very long time. Until then, the Manor House series and Kingsbury's new series (under the name of Kent) will have to suffice. "I made through 80+ pages before I finally put the book down and said "Enough, I can't take it any more."" This has happened to me several times with many different types of books as well. I thought it was interesting how you wrote about the disappointment you felt in trying to read these books. I've never thought of keeping track of those that I didn't like and it is something to think about doing for myself. Perhaps, like having a partially read list. Sometimes I think why I can't get through a book is my fault with my time being so limited when it could be that I didn't like it to begin with. It could save me from wasting time trying to read something again that I didn't really like. "Oh, yeah, there's a murderer running around Sitting Marsh killing American GIs who have red hair with daphne berries which are toxic." Very witty! It peaked my interest. Typically if I find an author that's rubbed me the wrong way with a series, I'll give the author another chance in another series. More often than not, it doesn't work out and I'll avoid the author completely. Because I had made it so far into those books, I felt they deserved a mention. Also, it was therapy to get it out of my system. It took me a long time to realize I could put down a book/author and not feel guilty. There are other books more deserving of my time. While I do make certain allowances, there's a limit to what I'll put up with from a writer. I do believe I'm a more discriminating reader now than when I was much younger. Glad you like the witty comment. I tried to make a small point that the murder seemed like an afterthought and it focused more on Lady Elizabeth's feelings for Earl. Because this is the sixth book in the series, I've decided to let it go. But it was a good to get back to a good story and writing.